FROM JASON’S DESKTOP — No moving parts. No interchangeable weapons. No transforming. No bright colors. No battle damage chests. No remote controls. 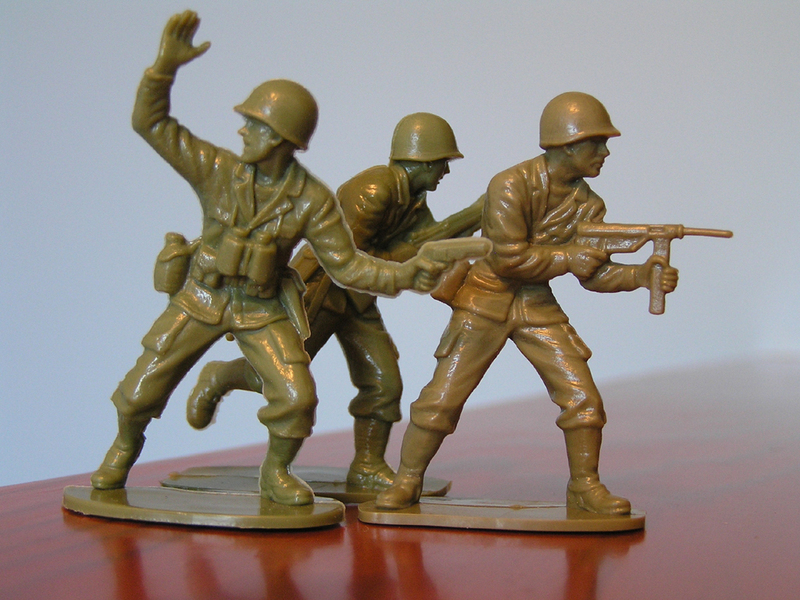 Army men were just solid-stamped molded plastic. And that left the door open for so much creativity. My family didn’t have much money when I was young, so shelling out $60 for an Optimus Prime or even $7 for a G.I. Joe was pretty much out of the question. But grabbing a 30-piece army men set off the grocery store rack for $2 every once in a while was well within the budget, and it was enough to keep a five-year-old amused for hours. 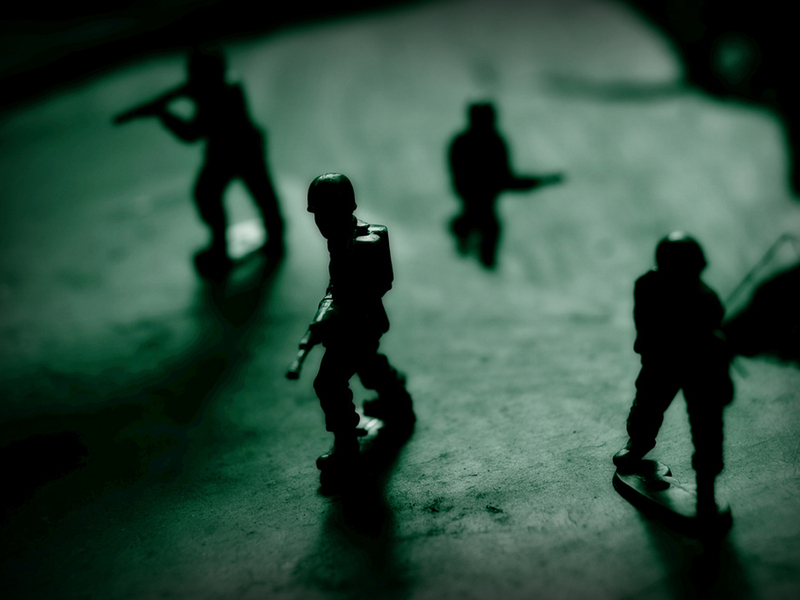 My army men waged thousands of campaigns. The sandbox became the desert theatre. The tall grass became the African front. The loamy dirt beneath the trees became home to jungle warfare. The brave soldiers of Jason’s Army also lived and died to protect countless staircases, book shelves, and wooden block forts. After some digging around, I discovered the toys I loved so much were the Vietnam-era M-16 Infantry line made by Tim Mee. They were actually the last run before the company cut production. Mine had all the classic members of the corps: Crouched machine-gunner, pistol-wielding commander, flame-thrower, bazooka-guy, radio guy, minesweeper, crawling soldier, the soldier swinging his bayonet overhead, the soldier waving his troops forward with machine gun in hand, the mortar launcher. Once in a while, the army men would come bundled with half-tracks, tanks, jeeps, and emplacements. If you want to be cheap, though, you could always take the tack my little brother and I once did: Use army men as chess pieces. Bayonet guys make great pawns. Bazooka guys make excellent rooks. Flamethrowers work just fine as bishops. Mortars make sense as knights. Machine-gunners are the logical queens, and the pistol-wielding commander is the only choice for king that makes sense. FROM JASON’S ROBOT AND DINOSAUR OBSESSIONS — Robotix was to LEGOs what MASK was to Hot Wheels. It had a limited release, an oh-so-brief flare of popularity, and then collapsed into obscurity when marketing agents turned their backs on it. A product of Toei Animation — the Japanese studio that gave rise to both Hayao Miyazaki and Isao Takahata — Robotix was a typical 1980s cartoon enterprise in that it was a blatant vehicle for a toy line. The “Motorized, Modular Building System” made by Milton Bradley was comprised of interlocking blocks, gears, differentials, winches, tires, and sci-fi accouterments. It was a worthy antecedent to the far more successful LEGO Mindstorm franchise, and is surprisingly still sold today (though by a different manufacturer and distributor). Every set made is still backward-compatible to the original 1984 systems. Those systems were the byproducts of a 90-minute movie which aired just once in 1985 as part of the syndicated Super Sunday. The Marvel Entertainment block ran several serialized ‘toons, including Jem, Bigfoot and the Muscle Machines, and Inhumanoids. It split Robotix into 15 six-minute shorts. Jem and Inhumanoids became popular enough to warrant full-length treatments, but at the end of their respective runs, Bigfoot and Robotix got stomped into cartoon purgatory. I was five years old, living in Oregon at the time, and happened to see a couple of those episodes. Like any true 1980s man-cub, I was captivated by the Eastern animation idea of mecha; I was equally caught by the magnetism of GoBots, Transformers, and RoboTech, Exo-Squad, AT-ATs and AT-STs, Centurions, and of course Voltron. So I was stupidly happy when a family friend (I believe it might have been a sometime babysitter) purchased a Robotix kit for me that Christmas. Certain clickable pieces, which themselves resembled smaller red-and-chrome robots, remained in my possession for years, finding an out-of-place life in the ol’ LEGO bucket. They may still be there, hidden away in my parents’ attic, held hostage along with some action figures and comic books until such time as I give my parents some grandchildren. Some awesome person posted the full Robotix series on YouTube two years ago, and it has yet to be yanked down on any kind of copyright claim, which is excellent because the ‘toon is only on DVD in the UK. Helmed by Wally Burr, voice director of G.I. Joe the Movie, it’s rendered in the same detailed anime style of the 1980s’ most memorable 22-minute-long toy commercials. It’s also got some of the most interesting pulp plot elements: Stars going nova, lizardmen, giant robots, benevolent supercomputers, suspended animation, alien spirits transfered into machines. Peter Cullen, who was Pincher from GoBots, Zander in G.I. Joe, Optimus Prime in Transformers, and Cindarr in Visionaries. Frank Welker, known for playing Scooter from GoBots, Megatron in Transformers, Torch in G.I. Joe, and Slimer in The Real Ghostbusters. Pat Fraley, aka Marshall Bravestar, Krang on Teenage Mutant Ninja Turtles, Max Ray on Centurions, and Ace in G.I. Joe. Corey Burton, who was Spike in Transformers, Tomax in G.I. Joe, and Dale from Chip & Dale’s Rescue Rangers. Michael Bell, who had big roles as Duke in G.I. Joe, Lance in Voltron, and Prowl in Transformers. Arthur Burghardt, who was Devastator in Transformers, Destro in G.I. Joe, and Turbo in GoBots. Robotix also had narration by Victor Caroli, who did the same type of voice-over for Transformers: The Movie in 1986 and several of the television series’ episodes. That, and many stylistic choices (such as the rock-anthem theme that’s one-half “who you gonna call” and the other half Max Hedroom), made it obvious Marvel was trying to capitalize on the Transformers craze and hoping to spur a similar sales frenzy. It’s a shame, because as such things go it wasn’t a bad story line, boasting a bit more complexity than most children’s adventures of the day. Of course, Robotix had the normal, innocent lack of moral ambiguity as most shows; the bad guys were determinedly evil, the good guys irreproachably ethical. But it also cooked up some interesting Cold War metaphors, and served them on a plate of techno-imagination to a pre-computer-literate audience. I guess I pine a little too much for these old-style cartoons. They seem so much more detailed and rich and imaginative than the line-and-paint-bucket-fill computer-aided works aired today by Nickelodeon and Cartoon Network. And believe me, I’m tired of the modern “burps and farts are funny” and “wacky, zany people doing anti-social and ludicrous things” mentalities. I wish we could go back to blasting through the universe in spaceships that look like oversexed submarines with fins, and exploring the jungles of exotic planets filled with dangerous and mythical inhabitants.